However, ISIS is so reviled that it was just possible a very well-targeted war on ISIS may have won some hearts and minds. Certainly, even for those of us solidly anti-war, there should be no talk of “defending” ISIS, whatever that may mean. Likewise, if last year’s proposed (in my view imaginary) US attack on the Assad regime had become reality, it would have been necessary to oppose the war without giving a skerrick of “defense” to the genocidal regime that had just gassed hundreds of sleeping children to death with sarin. However, the US is not only attacking ISIS – which the Free Syrian Army (FSA) and the united rebel alliance has been at war with for the last year – but from the outset has also attacked Jabhat al-Nusra (JaN). Despite also being a sectarian organisation which the FSA will have to deal with in the future in its own time, based on its own decision making, JaN has for the most part been fighting on the side of the FSA and the other rebels against both the Assad regime and ISIS. There have also been unconfirmed reports that the US has attacked Ahrar al-Sham in Aleppo – AaS is what might be called the most “jihadist” wing of the Syrian rebels other than JaN, which, however, unlike JaN, is not associated with al-Qaida. AaS has been operationally allied to the Free Syrian Army (FSA) and, along with the FSA, has been at war with both the regime and with ISIS. US officials seemed unconcerned by the possibility – one explained “we’re characterizing our targets as Khorasan and [ISIS] but it’s possible others were there. It is a toxic soup of terrorists” (http://www.buzzfeed.com/mikegiglio/us-goes-to-war-with-jabhat-al-nusra#39p8mlr). In other words, the US and its allies have taken advantage of the revulsion against the clerical-fascist ISIS barbarians to launch an attack on the Syrian revolution on behalf of the secular-fascist Assad regime. According to early reports from the Syrian Observatory for Human Rights, US air strikes killed 50 Al-Nusra militants and eight civilians, including children, in northern Syria on Tuesday (http://www.dailystar.com.lb/News/Middle-East/2014/Sep-23/271641-eight-civilians-30-fighters-killed-in-us-led-strikes-on-nusra-front-in-syria-activists.ashx#ixzz3E8z2uYK4). “Northern Syria” here refers to Idlib and Aleppo. For the record, there is no ISIS whatsoever in Idlib – ISIS was driven out root and branch by the FSA’s Syrian Revolutionaries Front (SRF) in January, probably the most successful anti-ISIS operation carried out by any of the forces at one time or another fighting ISIS, whether the Syrian Army, the Iraq army or the Kurdish forces. Yet while ISIS is comprehensively absent, the US air force launched a series of air strikes on the Kafr Dariyan region of Idlib, killing dozens of al-Nusra militants, while the civilian death toll shot up considerably compared to the initial reports (https://www.facebook.com/RadioFreeSyria/posts/706573779427832). Here’s also video footage of this terror: https://www.youtube.com/watch?v=dnQMgCo0Z2I. According to Nusra, their weapons factory near Sarmada in rural Idlib – where they produce weapons to fight the regime and ISIS – was targeted by US airstrikes (https://twitter.com/JihadNews2/status/514264176060301312). In particular, given the grave situation in Aleppo, where the revolutionary forces are being jointly besieged from the south and the north-east by Assad and ISIS, the fact that the first US attacks were on JaN inside Aleppo – where JaN is playing an important role in the epic defense of the rebel-held, working—class, half of that city, alongside the FSA and other Islamist groups – is perhaps the most blatant attack on the revolution possible. Perhaps once the revolutionary forces have been crushed in Aleppo, Assad and ISIS may fight: the former will then present the world with a fait accompli, it’s my regime or ISIS, while the latter will present the impoverished, Assad-hating Sunni masses with precisely the opposite dilemma. That is why the defence of Aleppo now is all important. And at precisely that moment, dozens of Nusra fighters have been slaughtered by US bombers right there, in Aleppo. According to Nusra, “US airstrikes (with the help of Qatar, KSA, Jordan, UAE) hit positions of Jabhat an Nusra in Rural Muhandiseen Aleppo” (https://twitter.com/JihadNews2/status/514264771060072449) and scores of fighters were martyted in Jabhat al-Nusra headquarters in Urm al-Sogra, Aleppo (https://pbs.twimg.com/media/ByM2AKsCcAEO31v.jpg:large). Oddly, US warplanes have also bombed positions in Jabal Sha’er in Homs countryside, killing some Bedouins (https://twitter.com/SN4HR/status/514407392801718272). It is unclear what the intended targets were. Senior Jabhat al-Nusra leader, Muhsin al Fadhli, was killed by the US bombing (https://pbs.twimg.com/media/ByNu9kqCcAAjfSE.jpg:large), as was Abū Yusuf at-Turkī, Nusra’s no.1 sniper, in US air strikes on Idlib. The Assad regime must be very pleased with having acquired for itself a new airforce. These developments are remarkable not for the fact they happened – this was basically my exact prognosis in June (links.org.au/node/3928) based on class analysis – but rather in its sheer brazenness and rapidity. That a US attack “on ISIS" in Syria will become an attack on the revolution, via the device of attacking al-Nusra. Despite the jihadist Nusra leadership, much of its ranks are decent revolutionaries, often former FSA cadre just going where the money and arms are; and despite some its recent provocations (caused by the impact of ISIS victory in Mosul on the more jihadist part of the ranks), it still mostly fights the regime and ISIS. Attacking JaN is a way of attacking the revolution, just as the US has been trying to turn the FSA into a Sawha against JaN (not only against ISIS) since 2012 (http://www.thenational.ae/…/americas-hidden-agenda-in&#8230;). The FSA has always rejected this imperialist “advice.” According to FSA Colonel Akaidi last year, the US wants to turn the FSA “into the Sahwa”, but “if they [the US] help us so that we kill each other, then we don’t want their help” (http://www.ft.com/…/71e492d0-acdd-11e2-9454&#8230;). Then we had the recent UN resolution against ISIS that just happened to also be against JaN as well, nicely slipped in by Obama. Furthermore, all this is in the context of the open collaboration between the US (and its Saudi, UAE etc allies) and the Assad regime, which the US informed of the attacks, with which the US is sharing intelligence, and which has expressed strong support for the US attacks on its own country. “As for the raids in Syria, I say that what has happened so far is proceeding in the right direction in terms of informing the Syrian government and by not targeting Syrian military installations and not targeting civilians” (http://www.reuters.com/article/2014/09/24/us-syria-crisis-minister-idUSKCN0HJ19S20140924). The US strikes have of course killed some dozens of civilians, but that is hardly a concern of a regime that has killed so many tens of thousands of civilians, as a grand underestimate. Meanwhile, the pro-government news network Damascus Now hailed the strikes as a historic moment, in which “happiness was etched on the faces of the majority of Syrians, because they found international support towards eradicating a cancer which has been rooted in the diseased Syrian body”, referring to the rebels (http://syriadirect.org/rss/1580-syria-direct-news-update-9-24-14), and the regime’s Al-Watan newspaper declared “the US coalition and the Syrian Arab Army are on the same front against terrorism” (https://twitter.com/MousaAlomar/status/514789879180701697/photo/1). Revulsion has erupted right across Syria. In mass demonstrations throughout Aleppo (https://pbs.twimg.com/media/ByTcYjYCcAEeOnA.jpg:large), Idlib (https://www.youtube.com/watch?v=Ww2LT-Wcpcc&feature=youtu.be) and Homs, demonstrators chant “We are all Nusra” or “Jabhat al-Nusra came to support us when the world abandoned us” (https://pbs.twimg.com/media/ByTtNQkIYAETWtU.jpg:large). Now, as stated above, I certainly don’t love Nusra. But these chants mean the people identify with those getting bombed by Assad’s newly acquired airforce. For those who want to emphasise the reactionary nature of the Nusra leadership (which I would distinguish from its ranks), this development underlines the fact that creating counterrevolution works in differing ways: one way is to directly militarily attack a militia, like Nusra, that at this point is on the side of the revolutionary forces; another is to put extra pressure on the more pro-Western elements within the FSA to take the US side against Nusra, thus weakening and splitting their forces on the ground; and a third way is precisely allowing Nusra to denounce anyone who doesn’t support it now as a US agent, thus exactly strengthening Nusra, the most jihadist pole, within the anti-Assad, anti-ISIS front. Though this is by no means straightforward. The “we are all Nusra” chants may simply be identifying with those under US attack rather than expressing political support for Nusra; thus these demonstrations could equally be seen as a new, clearer anti-imperialist grounding of the revolution. It may take some time to work through what this dilemma means. But worse is the fact that by allowing its attack on ISIS – who everyone hates – to become an attack on Nusra, and a collaboration with the regime, which all rebel forces and most of the impoverished, dispossessed Sunni masses see as their main enemy, the attacks have also led to a surge in support for ISIS in some quarters. To see mass demonstrations in support not only of Nusra, but also of ISIS, in areas as far west as Homs (https://www.youtube.com/watch?v=AlsxciMWxQQ&feature=youtu.be), and Idlib, underlines the multiple ways in which imperialist attack promotes counterrevolution: a mass demonstration supporting ISIS even occurred in Kafranbel in Idlib (https://www.youtube.com/watch?v=o2WegUb7Omc&feature=youtu.be, https://www.youtube.com/embed/V3-BRbeGmTI?feature=player_detailpage), the very heart and soul of the revolution! In any case, it is the reactions from the FSA and other rebels which are most remarkable. 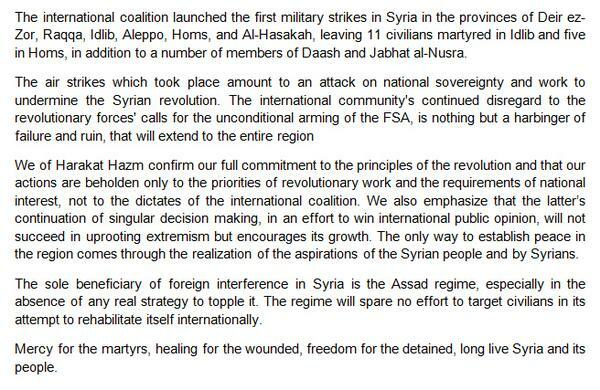 “The Hazem Movement rejects the external intervention of the US Coalition, which launched its first airstrikes on Tuesday in the governorates of Deir el Zour, Raqqa, al Hasaka, Aleppo, Idlib and Homs, with 11 civilians killed in rural Idlib province and five others in rural Homs province, as well as fighters from Jabhat al Nusra and the ISIS. “These air attacks amount to *an attack on national sovereignty* and work to *undermine the Syrian revolution* and demonstrate the international community’s continuing ignorance of the demands of the Syrian revolution and failure to provide unconditional military aid to the FSA is simply an indication of massive failure and a harbinger of further catastrophes that will harm the entire region. “We also affirm that the international community’s unilateral decisions taken in an effort to win public support globally will not succeed in combating extremism, but will actively promote its growth. The only way to achieve the peace in the nation and region will come through fulfilling the aspirations of the people of Syria at the hands of Syrians. “The only beneficiaries from the US coalition’s military intervention will be the Assad regime, in the light of an absence of any real strategy to oust it, and the regime will spare no efforts in its attacks on civilians in its attempt to rehabilitate itself internationally. “We pray for mercy for our martyrs, healing for our wounded, and freedom for the detainees imprisoned in Syria, and life and freedom for our beloved people” (https://pbs.twimg.com/media/ByPSsxMIYAQy2Wt.jpg). One of the extraordinary things about this statement is that, after all the years of “leftists” falsely asserting that the US was arming the FSA, when in fact it never sent them a bullet, is that Hazm is precisely one of the very few FSA units that *did* receive a handful of US anti-tank weapons beginning in April 2014. It was never very many, but Hazm could possibly have expected more if it played ball. This magnificent declaration indicates that while the US might be able to buy some dozens of puppets here and there, it is very difficult to buy an army of 7000 fighters to be your puppets. Meanwhile, Jaish al-Mujadeen, a markedly soft-Islamist coalition that was set up last December and which then played a major role, alongside the FSA and important components of the Islamic Front (of which it is not a member), in driving ISIS out of Aleppo in January, also condemned the US attacks (https://www.youtube.com/watch?v=9ClRaIMESbk&feature=youtu.be). Abu Ratib, head of the Sufi-led Al-Haq Brigade, part of the Islamic Front, termed the intervention “a total war against Muslims” (http://syriadirect.org/rss/1580-syria-direct-news-update-9-24-14); Suqour al-Sham, the main Islamic Front unit in Idlib, condemned the airstrikes and said they “will breed more extremism and terrorism” (https://twitter.com/zaidbenjamin/status/514831422675513344/photo/1); the Army of islam, the IF unit in Damascus, which drove ISIS out of the Damascus region several months ago, also condemned the strikes; the secularist FSA Forqat 13 issued a statement condemning US-led airstrikes as “aimed at weakening the revolution” in Syria (https://pbs.twimg.com/media/ByTaFn8IEAAANl3.png:large). 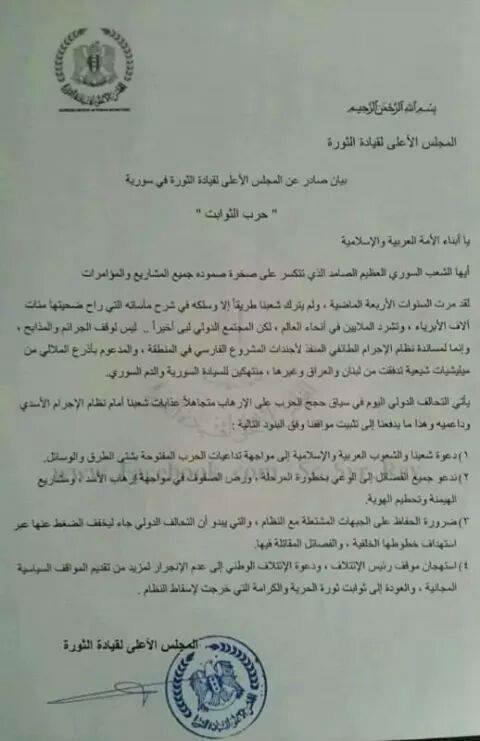 Then in a joint statement, the Syrian Revolutionaries Front (SRF – the major secular FSA coalition in the north-west, which single-handedly drove ISIS out of Idlib in January), Jaish al-Mujahidin, Al Zinki, Hazm and others condemned the US airstrikes, declaring “you help Bashar” (https://pbs.twimg.com/media/ByUiHcTIMAAmTDF.jpg). So while we haven’t yet accessed statements from every group, it is clear all the major groups have declared solidly against the US air war. In similar vein, Syria’s Muslim Brotherhood spokesperson Zuhair Salem declared “A new killer joins the band of the Syrian people killers. The war on Da’ash is an American pretext to continue the war on the Syrian revolution. We won’t wait for long to watch how the American war is eating revolutionary forces. We condemn the American crime of the aggression on Syrian territories” (https://twitter.com/zaidbenjamin). Finally, the founder and former leader of the FSA, Colonel Riad al-Asaad, who still has significant influence, declared “The Coalition kills the remaining children that the Syrian regime couldn’t kill” (https://pbs.twimg.com/media/ByO1CbHIIAABquB.jpg:large). Earlier, he had already declared that the FSA will not collaborate with the US in the war against ISIS, claiming the US is working to destroy the FSA, noting that since 2011 the US promised aid that never materialised, and meanwhile they worked to split the rebels and to help al-Assad. Asaad claimed that the real target of the strikes would not be ISIS, but rather “the Syrian revolution will be eliminated under this pretext.” He also called on moderate rebels to make efforts for more unity to revive the Syrian revolution after having been hijacked by radical Islamist groups and West-backed agendas. “We are looking for rebel commanders who share us the national concern” (https://www.zamanalwsl.net/en/news/6704.html). 1- Assad’s regime is holding the sole responsibility of this violation of the Syrian State’s sovereignty since it was the first to do that bringing the sectarian death militias from Iran, Iraq and Lebanon. 2- Assad’s regime and ISIS are alike when it comes to terrorism and crimes violating the Syrian people dignity and decent lives. 3- The necessity of coordinating with the political and military forces of the Syrian revolution so they can regain control of the positions under ISIS conquer as well as helping these forces with their continuous battles against Assad’s regime till it is toppled. 4- Taking intense precautions that these air strikes do not give any form of political or military benefits to Assad’s regime. 5- Taking extra care of the civilians’ lives and their properties in the targeted areas. 6- The United Nations must take its responsibility towards the civilians by immediately responding to their humanitarian basic needs. 7- The Syrians salvation from ISIS should be synchronized with their liberty of the tyrant Assad’s regime and its terrorism against them. Local Coordination Committees (23/09/2014, from https://www.facebook.com/RadioFreeSyria/photos/a.382885705129976.91927.363889943696219/706708506081026/?type=1&fref=nf). The only more or less clear support for the intervention came from the pro-West and Gulf leadership of the exile-based Syrian Opposition Coalition (SOC) and its associated Supreme Military Command, supposedly of the FSA but in reality largely representing itself. The SMC declared support to “all earnest national forces and free international forces” who are trying to “fight terrorism,” but stressed that this should start with “the Assad gangs and Shabiha” and “ending with their new creation, i.e., ISIS” (https://pbs.twimg.com/media/ByPX7XDIAAA7RNW.png). The only other apparent support to the US coalition’s actions came from, somewhat understandably, the Kurdish PYD. PYD leader salih Moslem declared that the US attacks were a positive step for the fight against ISIS (http://civiroglu.net/2014/09/23/pyd_airstrikes/). Considering ISIS’ current genocidal attacks on the Syrian Kurds around Kobane, which have driven some 150,000 Kurds acrosss the Turkish border (Turkey already holds 1.5 million Syrian refugees), the PYD’s position is understandable. It is unclear at this point, however, how much the US has targeted the ISIS units doing the besieging of Kobane – at the outset, at least, the US seems to have been too busy bombing ISIS in Raqqa (from where most ISIS militants had already been evacuated) and non-ISIS targets over in western Syria, to simply bomb the ISIS advancing front line around Kobane (just as the Assad regime, while good at bombing bakeries in Raqqa and killing dozens of civilians, also couldn’t seem to target the ISIS siege). Where does this leave the US Sawha plans? This rather solid opposition to the US air campaign from the bulk of the FSA and their allies on the ground raises serious issues regarding the US intention to arm and train a small puppet segment of the FSA as a Sawha to fight ISIS, and premably Nusra, but not the regime. It seems likely there will be relatively few takers. Of course many may officially agree in order to get the arms, and then hope to do as they please and direct their energies at the regime; but the current united stand against the US shows not only that the FSA are not puppets, but moreover has rubbbed this fact in the US’ face. Hazm seems to have performed this trick earlier this year to get some US anti-tank weapons; it now releases the most solidly anti-imperialist declaration. It is worthwhile looking at the full text of the resolution in Congress to provide “training, equipment, supplies, and sustainment” some 5000 “vetted” rebels (https://www.govtrack.us/congress/bills/113/hjres124/text). Anyone in doubt that the aim is for them to fight ISIS but not the regime only needs to read the opening, which states the purpose is firstly, for “defending the Syrian people from attacks by the Islamic State of Iraq and the Levant (ISIL), and securing territory controlled by the Syrian opposition,” secondly, “protecting the United States, its friends and allies, and the Syrian people from the threats posed by terrorists in Syria, and thirdly, the bit that refers to the regime, “promoting the conditions for a negotiated settlement to end the conflict in Syria.” So, smash ISIS (and Nusra), and negotiate with the regime. The term appropriately vetted means, with respect to elements of the Syrian opposition and other Syrian groups and individuals, at a minimum, assessments of such elements, groups, and individuals for associations with terrorist groups, Shia militias aligned with or supporting the Government of Syria, and groups associated with the Government of Iran. Such groups include, but are not limited to, the Islamic State of Iraq and the Levant (ISIL), Jabhat al Nusrah, Ahrar al Sham, other al-Qaeda related groups, and Hezbollah. Now of course, the references to Shia groups associated with Iran, Hezbollah etc are just fluff, since this is a resolution on “vetting” members of the Syrian opposition. Hezbollah is works for the regime, so is irrelevant to this resolution. But if “vetting” is to check if any “elements, groups, individuals” have any “associations” not only with ISIS, but also with Jabhat al-Nusra, and even Ahrar al-Sham, then the resolution effectively wipes out 90 percent, if not more of the FSA and of the Syrian opposition as a whole. Since they all actively cooperate with Jabhat al-Nusra on the ground against both the regime and ISIS, and even more so with Ahrar al-Sham, whose leadership was just wiped out by a regime- or ISIS-bombing. By ruling out any “group” that has had any “association” with JaN and even with AaS, the US ensures its Sawha operation will remain with a very small group (perhaps even the proposed 5000, out of some 60,000 FSA fighters alone, cannot be reached) – always the intention anyway – so people should not confuse this with “training the FSA” and they should not confuse the US term “vetted” or the US use of the term “moderate” with “secular’ and “non-Islamist” as a whole – these few thousand will be secular/non-Islamist, but they will also be the most subservient – basically those who agree to fight only ISIS and leave the war on the regime till the future: the exact opposite of the priorities of the 95% that won’t be trained for Sawha. Former US ambassador Robert Ford explained this more clearly than usual recently: “One prominent American observer says it is folly to think that we can aid the moderate armed fighters to topple al-Assad. But toppling wasn’t our goal before and shouldn’t be now.” Certainly, extra arms can help the opposition “put pressure” on Assad to form a “new” expanded government, like just happened in Iraq, whose first aim would be to expel ISIS from Syria, so therefore “as we boost aid to the moderate armed rebels, we must condition that help on their reaching out to disaffected regime supporters and developing with them a common political stance for a new, negotiated national unity government, with or without al-Assad” (my emphasis) (http://us.cnn.com/2014/08/26/opinion/ford-isis-syria/index.html?sr=sharebar_twitter). In other words, while Obama long ago called on Assad to “step down” (this is the sole basis on which leftists imagine Obama called for “regime change”) in order to preserve his regime and state in a “Yemeni solution”, Ford is here making clear that if it could be negotiated, a “national unity government” would be fine even *with* Assad. But who can replace ISIS? Assad can’t. However, the US knows that it can not simply be Assad’s airforce. The US aim now seems to be to further eviscerate the revolution, in a number of different ways as explained. However, the question of who will replace ISIS on the ground if the US really wants to wipe it out – let alone if it also wants to wipe out Nusra – remains. Quite simply, in neither Syria nor in Iraq can ISIS be replaced by non-Sunni forces, still less by muderously anti-Sunni regimes. Some kind of Sunni forces will be necessary, just as the US needed to arm the Iraqi Sunni tribes in their “Sawha” against al-Qaida in Iraq in 2007-8. The Kurds have been valiant fighters against ISIS, but in defending their own Kurdish turf; only Sunni Arabs can replace ISIS on the ground among their Sunni base that they now control. The act of replacing the descredited Shiite chauvinist Maliki in Iraq before beginning to bomb ISIS was necessary façade; yet Maliki has been replaced by another member of his own party, only slighly less sectarian, with the hope that this may win over some Sunnis. So far, there has been little success; and fighting ISIS with Shiite sectarian militias simply consolidates Sunnis behind ISIS, including those who previously fought it. What hope is there then in Syria, where the Assad regime has been far more murderous than Maliki, has wiped entire Sunni towns and cities off the map and sent millions into exile? While the US now acts as Assad’s airforce to help smash the revolution, a stabilisation of the situation will eventually require the long-term US aim of doing some deal that encourages Assad and a narrow circle around him to “step down” in order to save the Baathist regime and its military-security apparatus, and to “widen” it by allowing in some select conservative opponents into the regime. The so-called ‘Yemeni solution.’ The difficulty being that the Assad ruling family and mega-capitalist clique is so much more completely associated with the state than a mere Saleh or Mubarak ever was. Is an attempt to crush the revolution for the regime a prelude to a plan with regime insiders and international factors to gently push Assad aside when it’s over to gain a modicum of Sunni support to replace ISIS on the ground? Like everything else, this remains to be seen, but is one of the possibilities – as is the possibility that the crushing of the revolution simply means the current regime becomes the “factor of stability” in the region.